I discovered Anneke’s via a chance encounter on pinterest and I have since become fascinated with her amazing work with felt. 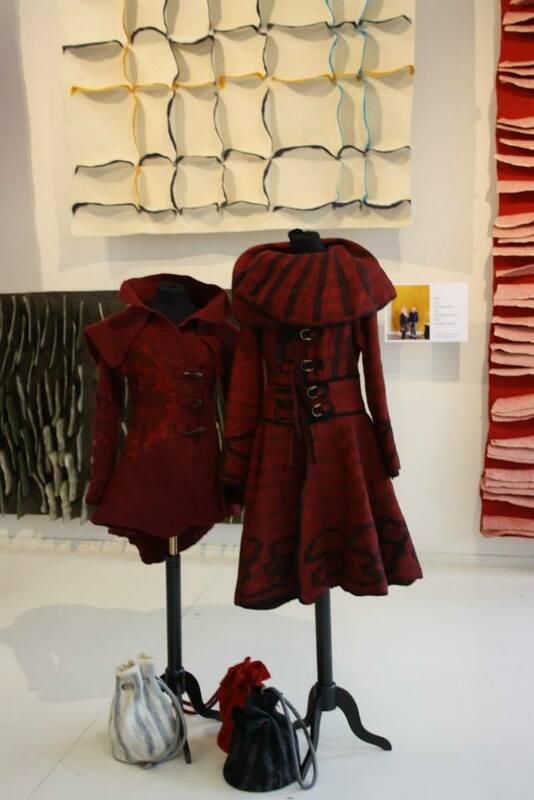 Anneke is a Dutch feltmaker whose works in two quite different areas, wearables and architectural felt. It was a challenge to find out about her inspiration as what information there is is mostly (understandably) in Dutch. However, her work is so unique I wanted to include it here as it illustrates an amazing versatility and a deep understanding of the properties of her chosen media and how they can be creatively exploited. 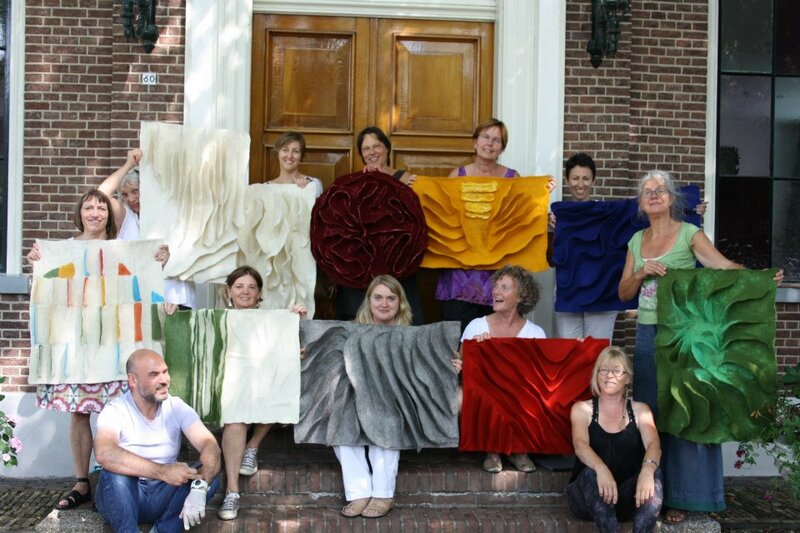 A interesting blog post by Elizabeth Lopeman sheds some light on Anneke’s work, life and inspiration. Anneke’s mother was a handspinner and taught her to spin, as well as encouraging her to learn fibre arts. The post isn’t specific but mentions the varieties in the way the coarse from the local sheep takes up dye and Anneke’s facebook page also refer to the fact that she is also a dyer. A former teacher, Anneke continues to teach felting to both adults and children. 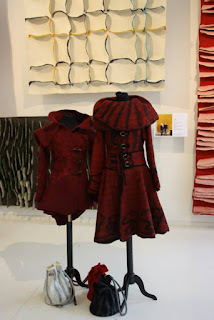 Her 3-d felt workshops look simply amazing and I would love to take one! 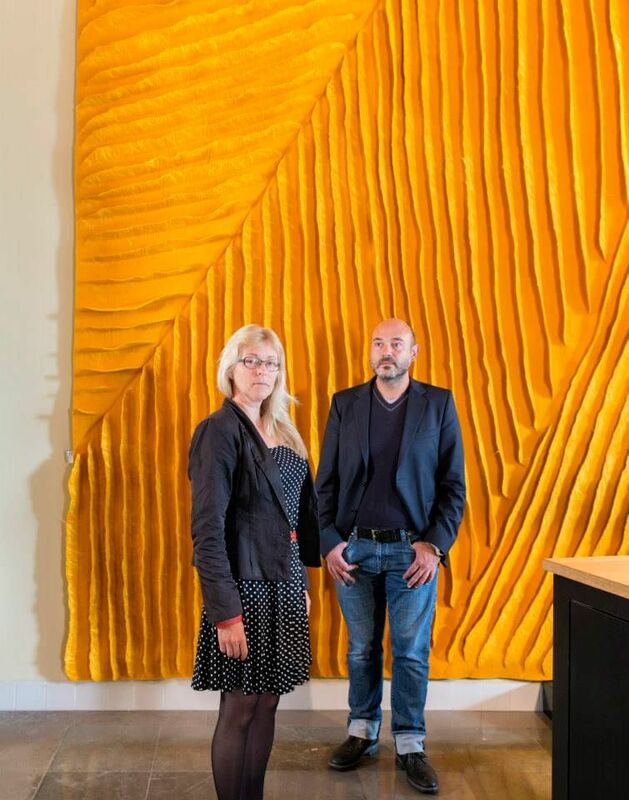 Felt for architecture is a collaborative project between Anneke and Italian interior designer Claudio Verone that began in 2003. The purpose of the project is to “..introduce the art of felt within spaces, with all its tactile visual and acoustic features, and with the overwhelming power, magic and sacredness of life”. Colours and shapes are stated to “originate mainly from the contemplation of the landscapes”. 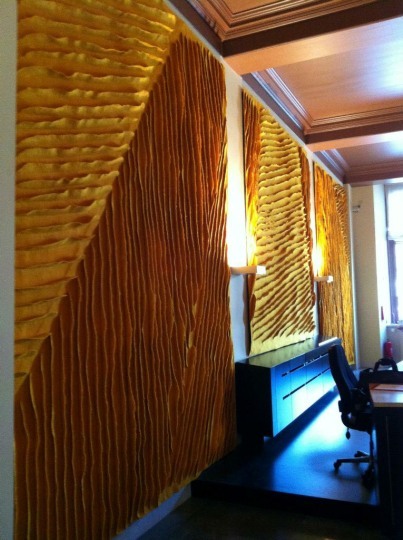 A particularly inspirational piece is a triptych installed in the Dutch Houses of Parliament. This series of images shows the construction and installation. The scale of the piece is audacious and inspiring! Seeing felt worked on such a large scale in a contemporary setting is indicative of the quality of Anneke and Claudio’s work. The architectural felt project is also an interesting contribution to the art vs craft debate. The installations serve a valuable function of absorbing sound and creating warmth as well as being beautiful pieces of art. 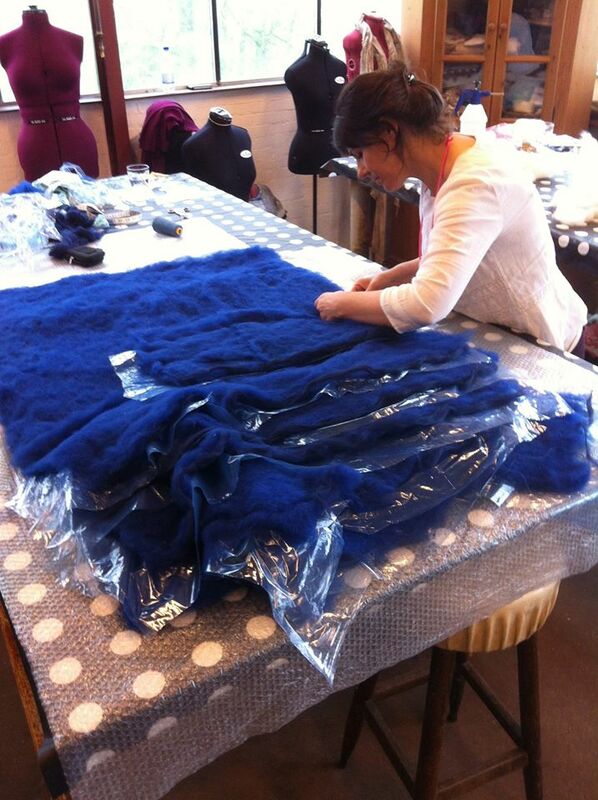 Yet feltmaking is often regarded as falling exclusively under the heading “craft”. F elt garments and accessories are perhaps more familiar territory to feltmakers and lovers of felt. 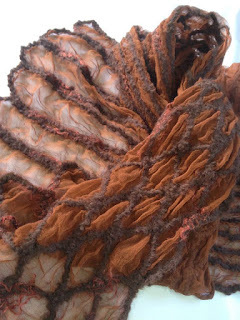 Anneke’s work incorporates felt and silk and the relationship between the two media are exploited to create texture and shape. 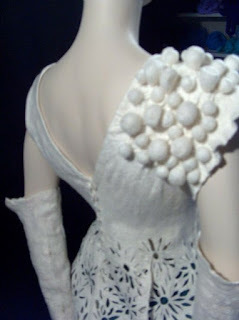 I particularly like the use of the felt as a fabric to create couture garments. Garments are fully styled and cut for shape and form. Often I feel that the felt is “sacrosanct” and the designer is reluctant to cut the felt to create more style-driven shapes. The garment is shaped to accommodate the felt rather than the felt being the fabric from which the garment is styled (which is understandable given that felt is time-consuming to make and I would be loathe to waste any too!). 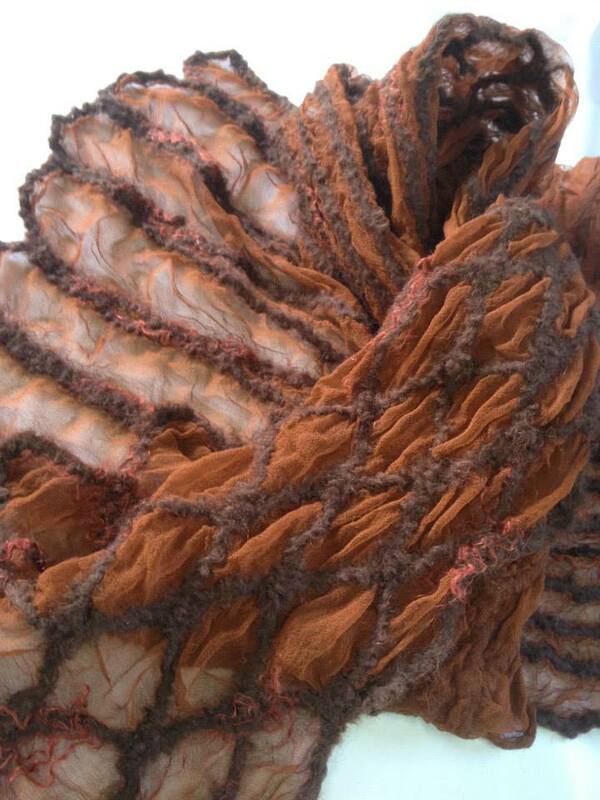 A nneke incorporates trapped objects and cut-felt in her work. Makeda is a stunning and dramatic example of these techniques, shown here in its full glory and with the close-up of the shoulder detail. Anneke Copier – felt artist on Pinterest | Architecture, Felt and Html. 2015. Anneke Copier – felt artist on Pinterest | Architecture, Felt and Html. [ONLINE] Available at: https://www.pinterest.com/hueanddye/anneke-copier-felt-artist/. [Accessed 30 August 2015]. Felt Like: Anneke Copier. 2015. Felt Like: Anneke Copier. [ONLINE] Available at: http://feltlikeblog.blogspot.co.uk/2010/03/anneke-copier.html. [Accessed 30 August 2015]. felt for architecture. 2015. felt for architecture. [ONLINE] Available at: http://claudiovarone.com/felt-for-architecture. [Accessed 30 August 2015].